I don't remember ever eating it growing up. I recall my mom saying she didn't really like it, and it took a long time to prepare, so there was never any eggplant served in the Schultz house. My first taste of eggplant was about 13 years ago when I purchased a 'share' of an organic farm, and each week I got a box filled with whatever was being harvested at the farm. I received plenty of eggplant that summer, and after experimenting with different recipes found that I really liked it. 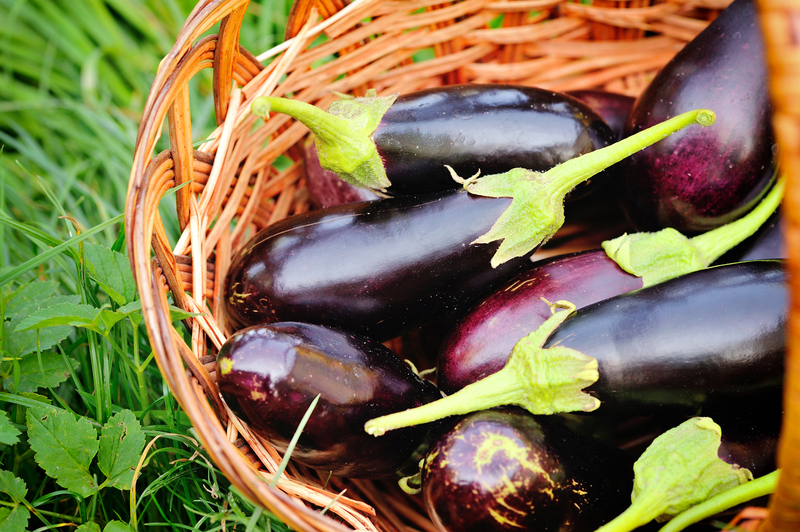 The name 'eggplant' became common in the 1700's, because early European cultivars were yellow or white skinned and the size and shape of goose or hen's eggs. The 'typical' eggplant cultivar grown in Europe and North America today produces an elongated oval fruit with a dark purple skin. In Europe, the eggplant is more commonly referred to as the 'aubergine', a name derived from one of the original Sanskrit names for the fruit. I've noticed this term is sometimes used as a name for the dark purple color reminiscent of many eggplants. I was stumped the first time I read a description in a catalog for something that gave 'aubergine' as one of the color choices—I guess it does sound a lot more exotic and sophisticated than 'dark purple'! Eggplant is never eaten raw, it is always cooked. Some cooks prefer to remove much of the water in eggplant to improve the quality of the finished dish. This process involves sprinkling sliced eggplant with salt and removing the water that is drawn out. This process is called degorging. This process will also reduce some of the bitterness associated with eggplant, though most new cultivars are not very bitter to start with, if harvested properly.